FRIENDSWOOD — Former Friendswood head football coach Steve Van Meter was instrumental in the formation of the 7-on-7 football program in the state of Texas many years ago. Following his retirement from coaching at Friendswood, the veteran coach accepted another challenge to become the first Athletic Director of Hutto ISD as well as assuming the head coaching reigns of the Hippos football program. His five years at Hutto set a new standard for which all future coaches and teams are challenged to follow. 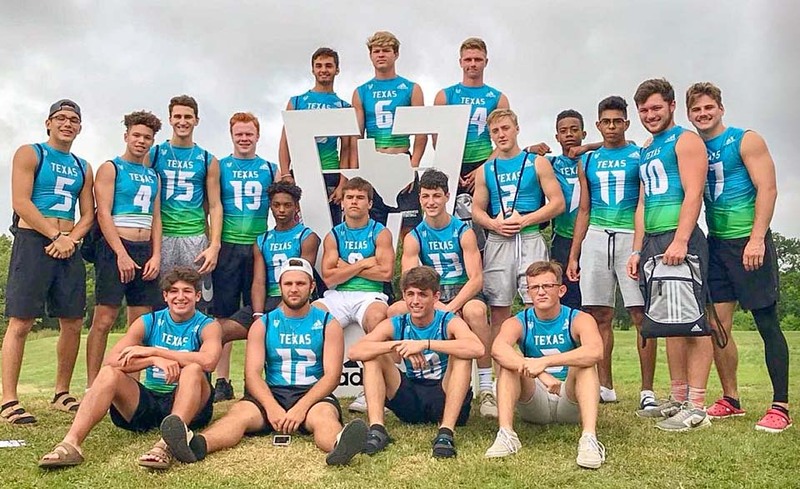 It was only fitting that upon Van Meter's recent retirement from Hutto, that Friendswood and Hutto would be placed in the same pool at the state 7-on-7 tournament. Even though the coaches of both schools cannot coach the teams -- it stands to reason that Van Meter and his former assistant and now Friendswood AD and head coach Robert Koopmann were both very interested in the outcome of the contest. Koopmann, who took over the helm of the Mustangs after Van Meter retired, has proven to be a worthy disciple of coach Van as he has guided Friendswood to the post-season all six seasons in developing his own legacy and it appears that the Mustangs will certainly be in the hunt this year. The Mustangs went 3-0 in pool play as they were in a very strong four-team pool. Friendswood beat Coronado 34-28 in the first game; Nolan Catholic 28-25 in the second game, and then edged Hutto 26-24 in the third game to advance to the championship bracket with Nolan Catholic was was 2-1 in pool play. Hutto finished 1-2 and Coronado finished 0-3 to go to the consolation bracket. On the second day, Friendswood continued their excellent play as they advanced to the quarterfinals of the championship bracket with wins over Belton (34-28) and Georgetown (35-28) before being nipped by Horn 27-25 on the last play of the game to end their 7-on-7 championship run.